The Kaiser-Martin Group is the premier builder of steel buildings and steel structures for the supply and manufacturing industries as well as the mining industry in the Northeastern United States. We have built steel buildings and structures for mines, quarries, concrete plants, waste water treatment plants and many other business sectors. We are the foremost authority on the design, capabilities, and installation of a wide variety of Pre-Engineered Steel Buildings and Structures for the industries of the Northeastern United States. The Kaiser-Martin Group has the capability to provide sealed engineering drawings for Pre-Engineered Steel buildings, Structural Steel buildings, and concrete footings. We are a complete scope, Pre-Engineered Steel and Structural Steel Building Erector ready to service our customers to the fullest. 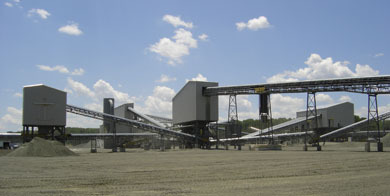 Call KMG today for all your mining, quarry, concrete plant, and other industrial building construction needs.